Women of 30-60 years of age are invited to take part in cervical cancer screening every five years. Some municipalities also invite women aged 25 and/or 65 for screening. About 70% of those invited participate in the screening for cervical cancer. A referral to colposcopy is given to about 1% of the participants. Additionally, about 5% are invited for a follow-up test before the next screening invitation (1.). One in three women who regularly participate in screening has an abnormal screening finding at least once that requires follow-up (2.). Cervical cancer screening detects cancer precursors in addition to the direct cancer signs. 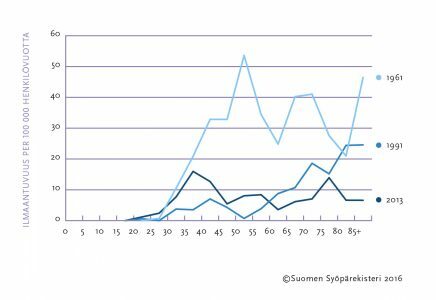 Over 600 precursors and early stage cancers are detected by the screening programme in Finland every year. These can all be cured. It has been estimated that screening avoids more than 250 cancer deaths in Finland each year (3.). Screening of the over 60-year-old women also reduces the incidence of cervical cancer and mortality (4.). For this reason, the health authorities in Finland are considering extending the screening programme also to the over-60-year-olds. Cervical cancer has become less common due to screening. The rate of new cancers found annually in the population and the deaths resulting from them have decreased to one-fifth of that of the 1960s (Figure). At present, about 160 new cases of cervical cancer are diagnosed in Finland each year, and about 55 women die of cervical cancer annually. The main indicators of cervical cancer screening can be found in screening statistics. Incidence of cervical cancer by age group in 1961, 1991 and 2013. Screening was started in 1963 and extended to the country as a whole in the early 1970s. The conventional cervical screening test used in Finland has been the Pap test, whereby a cell sample is taken from the cervix and subjected to cytological examination by light-microscopy. Along with the Pap test, the HPV test is applicable to cervical cancer screening for women over the age of 35 (5.). The HPV test uses a cell sample obtained from the cervix to detect the DNA of the human papilloma virus (HPV). The aim is to detect high-risk types of HPV, such as HPV 16 and 18. Samples for HPV and Pap are taken from participants in the HPV screening. Following a positive HPV test, the Pap sample is also analysed, after which any further management required is decided. The screening HPV test must meet the requirements of the IARC and WHO. Before being implemented, the validity of new HPV tests must always be verified by comparing them with the most studied HC2 or PCR GP5 + / 6 + tests. More information about cervical cancer screening on Free from cancer -site. In 2013, the HPV vaccination programme for preventing human papilloma viral infections commenced as part of the national vaccination programme (6.). HPV vaccination is offered to girls aged 11 to 12 through school health care services. The goal of the vaccination programme is to reduce the prevalence of HPV viruses and the prevalence of illnesses related to them in the female population. So far, the vaccination programme has not reduced the need for screening for cervical cancer prevention. The annual review provides a comprehensive overview of the Finnish cervical cancer screening program. The screening program is presented in terms of attendance, screening outcomes, time series and costs of screening. The history of cervical cancer screening in Finland and its impact on cancer burden is also discussed.